Last updated on: 26 March 2019. Nicholas Hilmy Kyrgios (/ˈkɪriɒs/ KIRR-ee-oss; born 27 April 1995) is an Australian professional tennis player who is currently ranked world No. 33 in men's singles by the Association of Tennis Professionals (ATP). He is currently the second highest-ranked Australian in the ATP rankings. Kyrgios has won five ATP Titles, and has reached eight ATP finals, including the 2017 Cincinnati Masters. During his junior career, Kyrgios won the boys' singles event at the 2013 Australian Open and the boys' doubles event at the 2013 Wimbledon Championships. During his professional career, Kyrgios reached the quarter-finals of the 2014 Wimbledon Championships—upsetting then world no. 1 Rafael Nadal and world no. 13 Richard Gasquet en route—and the quarter-finals of the 2015 Australian Open. Kyrgios is only the third player, after Dominik Hrbaty and fellow Australian Lleyton Hewitt, to have beaten Roger Federer, Rafael Nadal and Novak Djokovic in their first meetings. Kyrgios was born in Canberra, Australia to a Greek father, Giorgos ("George") and a Malay mother, Norlaila ("Nill"). His father is a self-employed house painter, and his mother is a computer engineer. His mother was born in Malaysia as a member of the Selangor royal family, but dropped her title as a princess when she moved to Australia in her twenties. He is the third of three children; his brother, Christos, is a lawyer, and his sister, Halimah, is an actress. Kyrgios attended Radford College until Year 8 and completed his Year 12 certificate in 2012 at Daramalan College in Canberra. He is a Greek Orthodox Christian and always wears a gold necklace with a cross on it. Kyrgios was a promising basketball player who represented the Australian Capital Territory and Australia in his early teens before deciding to focus solely on tennis when he was 14 years old. Two years later he gained a full scholarship at the Australian Institute of Sport, where he was able to further develop his tennis. In 2013, Kyrgios relocated his training base from Canberra to Melbourne Park in an attempt to further his career with better facilities and hitting partners. A year later Tennis ACT announced a $27 million redevelopment of the Lyneham Tennis Centre in Canberra to lure Kyrgios back home and host Davis Cup and Fed Cup ties. Kyrgios confirmed in January 2015 that he would return home and base himself in Canberra. He also donated $10,000 towards the Lyneham Tennis Centre redevelopment. Kyrgios is an avid fan of the Boston Celtics in the NBA and Tottenham Hotspur in English football's Premier League. His sports idol is NBA player Kevin Garnett. His idols growing up were Roger Federer, Jo-Wilfried Tsonga, LeBron James and Michael Jordan. Kyrgios also supports the North Melbourne Kangaroos Football Club in the Australian Football League. Kyrgios at the end of 2017, showed interest in cryptocurrency, more specifically an Australian-based initial coin offering. Kyrgios is in a relationship with Croatian-Australian tennis player Ajla Tomljanović. They briefly broke up after his loss at Wimbledon 2017, when Kyrgios was photographed dancing and clubbing with other female tennis players. He reaffirmed their relationship during Australian Open 2018. Kyrgios won his first ITF junior tour title in Fiji in June 2010, aged 15. He started to compete more regularly on the junior tour in 2011, making his junior grand slam debut at the 2011 Australian Open. During 2012 he won two junior grand slam doubles titles and rose to junior world number three, though he withdrew from the Australian Open Men's Wildcard Playoff due to injury. Moving into 2013, he gained the number 1 junior ranking by defeating Wayne Montgomery in the Traralgon International final. A week later he entered the Australian Open as the juniors number 3 seed and progressed to the final against fellow Australian Thanasi Kokkinakis. After saving two set points in the first set, Kyrgios won his first and only junior grand slam title. In his first round qualifying match at the 2012 Australian Open, Kyrgios won the first set in a tie-break. However, his opponent Mathieu Rodrigues cruised through the second and third sets to eventually defeat him. Kyrgios then competed on the 2012 ITF Men's Circuit for the rest of the season, competing in tournaments in Australia, Germany, Japan and Slovenia. At the end of the season, he had reached a semi-final and a quarter-final in Australian tournaments. He finished the year with a singles ranking of 838. Kyrgios commenced the year ranked at number 838 and played his first professional tournament of the year at the 2013 Brisbane International, losing in the first round of qualifying to James Duckworth. He then lost in the first round of qualifying at the 2013 Australian Open to Bradley Klahn in straight sets. After winning the Boys' Singles, Kyrgios said his goal was to reach the top 300 by the end of the year. Kyrgios was given a wildcard into the qualifying competition of the 2013 French Open. However, on 20 May it was announced that John Millman was forced to withdraw from the main draw due to injury, which meant Kyrgios's wildcard was raised to the main draw. This meant he would compete in a main draw of a Grand Slam tournament for the first time. In the first round Kyrgios had the biggest win of his career to date against the former world number 8 Radek Štěpánek in three sets, each of these ending in tie-breaks, giving him the first ATP Tour level win of his career. Although he ultimately lost to Marin Čilić in the following round, his ranking rose to number 213. Kyrgios later qualified for the 2013 US Open, where he was beaten by fourth seed David Ferrer in his opening match. He reached a new career high of number 186 on 9 September 2013. In October, Kyrgios made the semi-final of the 2013 Sacramento Challenger, before falling to Tim Smyczek. He ended the year with a singles ranking of 182. Kyrgios was to commence the 2014 season by making his debut at the 2014 Brisbane International after receiving a wildcard. However, he withdrew before the commencement due to a shoulder injury. 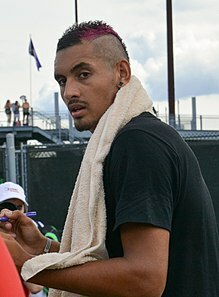 On 8 January, Kyrgios was awarded a wildcard into the 2014 Australian Open, where he won his first-round match against Benjamin Becker in four sets. He lost in the second round to the 27th seeded Benoît Paire in five sets despite winning the opening two sets. Kyrgios received a wildcard into the 2014 U.S. National Indoor Tennis Championships, where he lost his first-round match to Tim Smyczek in three sets. Kyrgios was then forced to withdraw from numerous ATP tournaments in Delray Beach and Acapulco due to an elbow injury. Kyrgios returned at the 2014 Sarasota Open where he reached the final by defeating Jarmere Jenkins, Rubén Ramírez Hidalgo, Donald Young and coming from a set down against Daniel Kosakowski. He defeated Filip Krajinović in straight sets for his second career challenger title. Kyrgios reached the final of the 2014 Savannah Challenger, where he defeated second seed Jack Sock for the title. Kyrgios received a wildcard into the 2014 French Open. He was defeated in the first round in straight sets by 8th seed Milos Raonic. Kyrgios won his fourth career challenger title and his third of 2014 when he won the 2014 Aegon Nottingham Challenge beating fellow Australian Sam Groth in straight-set tie-breaks. In June, Kyrgios received a wildcard to the 2014 Wimbledon Championships. In the first round he defeated Frenchman Stéphane Robert in four sets to advance to the second round, where he defeated 13th seed Richard Gasquet in a five-set thriller in which he had to come back from two sets to love down, and save nine match points over the fourth and fifth sets. In the third round, Kyrgios beat Czech Jiří Veselý in four sets, before going on to record the biggest win of his career so far by beating world number one Rafael Nadal in four sets to become the first male debutant to reach the Wimbledon quarter-finals since Florian Mayer in 2004. The shot of this match was a rear-forehand, half-volley winner from between Kyrgios's legs that David Polkinghorne of The Canberra Times described as "freakish" and "audacious". Kyrgios subsequently lost to eighth seed Milos Raonic in four sets. Having reached the quarter-finals, Kyrgios, ranked 144th at the time, broke into the top 100 of the ATP World Rankings for the first time in his career. Following his Wimbledon performance, Kyrgios's ranking rose to 66. He came away with AU$409,806 in prize money for reaching the quarter-finals—having earned just $248,000 in his career before the tournament. In the Rogers Cup tournament in Toronto following Wimbledon, Kyrgios earned his first ATP World Tour Masters event win with a first-round victory over Santiago Giraldo in straight sets. Kyrgios lost in the second round to 8th seed Andy Murray, winning just four games. In the US Open, Kyrgios made it to the third round, defeating Mikhail Youzhny (seeded 21st) in four close sets, and Andreas Seppi in straight sets, before losing to 16th seed Tommy Robredo in four. Kyrgios later played in the Malaysian Open, but lost in the first round. He skipped the rest of the season, citing burnout. He ended the year ranked 52nd in the world, and the second-ranked Australian behind Lleyton Hewitt. Kyrgios began his season at the Sydney International, but lost his opening match against Jerzy Janowicz in three tightly contested sets. This was followed by an appearance at the 2015 Australian Open, where he received direct entry due to his ranking for the first time. He defeated Federico Delbonis in a five-set thriller in his opening match, before going on to beat the 23rd seed Ivo Karlović in the second round and then Malek Jaziri in straight sets in the third. He then faced Andreas Seppi, who had just beaten Roger Federer in his previous match, in the fourth round. Kyrgios fell two sets behind and faced a match point late in the fourth set but recovered to win in five sets, the final set lasting 14 games. He thus became the first teenage male to reach two Grand Slam quarter-finals since Federer in 2001, and the first Australian male to reach the quarter-finals since Lleyton Hewitt in 2005, and the first Australian of any gender since Jelena Dokic in 2009. Kyrgios lost to eventual finalist Andy Murray in the quarter-finals in three sets. Following the tournament, he reached a career-high ranking of no. 35 in the world. He later withdrew from tournaments in Marseille and Dubai due to a back injury he suffered during the Australian Open. In Indian Wells, he served for the match against Grigor Dimitrov, but rolled his ankle and ultimately lost. He stated he would be out from 4 to 6 weeks due to the ankle injury. He returned in the Barcelona Open. After receiving a bye in the first round, he would lose in three sets against fellow 19-year-old Elias Ymer. At the Estoril Open, Nick reached the final of an ATP tournament for the first time in his career, after defeating Albert Ramos Viñolas in three sets and over two hours, Filip Krajinović in two sets, Robin Haase under an hour and Pablo Carreño Busta in nearly two hours. He then lost to the fifth seed Richard Gasquet in the final in straight sets. At the Madrid Open a week later, Kyrgios defeated world number two and 17-time Grand Slam champion Roger Federer in the second round, saving two match points in the final set tie-break in the process. He then had a three-set loss to John Isner in the third round. 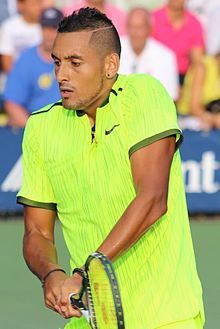 Prior to his finalist appearance at Estoril and round-of-16 finish in Madrid, Kyrgios had the unique distinction of having won more matches in Grand Slams (10 wins) than on the regular ATP Tour (2 wins). Later in May at the French Open, Kyrgios was seeded 29th, his first Grand Slam seeding. He won in straight sets in the first round against Uzbekistani Denis Istomin. He then received a walkover into the third round after his scheduled second-round opponent, Kyle Edmund, withdrew with injury. In the third round, he lost in straight sets to third seed Andy Murray. In the doubles, Kyrgios and partner Mahesh Bhupathi lost in straight sets in the first round to wild cards Thanasi Kokkinakis and Lucas Pouille. 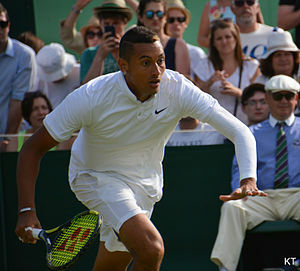 Seeded 26th at Wimbledon, Kyrgios opened with straight-set victories over Argentines Diego Schwartzman and Juan Mónaco in the first and second rounds, respectively. In the third round, despite losing the first set, he advanced past seventh seed Milos Raonic before losing to Richard Gasquet in the fourth round, squandering set points in the fourth. During the tournament, he was involved in several controversies during matches, all of which resulted in code violation warnings. During his first-round match against Schwartzman, Kyrgios threatened to stop play following a disputed line call. In the following match, he was heard saying "dirty scum" by a linesman; Kyrgios said his words were not directed toward the umpire chair. During his third-round match against Raonic he smashed his racket, which bounced into the spectators stands, following a missed break point. Kyrgios fell out of the top 40 in the rankings following the tournament. Kyrgios began his year at the Hopman Cup alongside Daria Gavrilova as part of the Australia Green team. In the round robin, Australia Green won 3–0 against Germany, with Kyrgios winning his singles match against Alexander Zverev in three sets, and later partnering Gavrilova for a three-set win in the mixed doubles. In his second round-robin tie against Great Britain, Kyrgios recorded his first-ever win against then world number 2 Andy Murray in straight sets and he also won the doubles with Gavrilova in three sets, to claim a 2–1 win over the British team. He went on to win the Hopman Cup with Gavrilova, defeating Ukraine in the final which earned Kyrgios his first professional title of any category of professional tennis on the World Tour. At the Australian Open he claimed straight-set wins over Pablo Carreño Busta and Pablo Cuevas before losing to sixth-ranked Tomáš Berdych in 4 sets. Kyrgios won his maiden ATP title at the Open 13 in Marseille by defeating world number ten Richard Gasquet in the quarter-final, world number eight Tomáš Berdych in the semi-final and world number twelve Marin Čilić in the final, all in straight sets. Kyrgios finished the tournament without having his serve broken. At the Dubai Tennis Championships Kyrgios reached the semi-finals where he retired against Stan Wawrinka whilst down (4–6, 0–3). His run included a second consecutive victory over Tomáš Berdych again in straight sets in the quarter-finals, and wins against Mikhail Kukushkin and Martin Kližan. At the 2016 Indian Wells tournament, he lost in the first round to Albert Ramos Viñolas (6–7, 5–7). At the 2016 Miami Open Kyrgios reached his first ATP World Tour Masters 1000 semi-final with straight-sets wins against Marcos Baghdatis, Tim Smyczek, Andrey Kuznetsov and Milos Raonic. He lost in the semis in straight sets to Kei Nishikori. Following the tournament, Kyrgios moved into the world's top 20 for the first time, becoming the youngest player to be ranked in the top 20 since Marin Čilić, seven years previously. Kyrgios then played in the Estoril Open his first clay tournament of the year. He was the runner-up here last year. He played his first match on his birthday winning (7–6(7–4), 7–5) against Íñigo Cervantes. He then played Borna Ćorić, defeating him in straight sets (6–4, 6–4). In the semi-finals he lost to eventual champion Nicolás Almagro in straight sets (3–6, 5–7). He then played in his first clay court Masters 1000 event of the season in the Mutua Madrid Open. He opened his campaign against Guido Pella in his first round, winning (7–6(9–7), 6–4). He then defeated world number 4 Stan Wawrinka in the second round and Pablo Cuevas in the third round, before losing in the quarter-finals to world number six Kei Nishikori in three sets. Kyrgios next played at the Rome Masters, defeating local wildcard Salvatore Caruso and world number ten Milos Raonic in the first two rounds before losing to 5th seed Rafael Nadal (7–6(7–3), 2–6, 4–6) in the third round. Kyrgios then played at the second major of the year at the French Open as the 14th seed where he defeated Marco Cecchinato and Igor Sijsling to reach the third round, before losing to 9th seed Richard Gasquet. Kyrgios then had a first-round loss at Queen's Club to 3rd seed Milos Raonic despite winning the first set. Kyrgios then played at the third major of the year at Wimbledon as the 15th seed. He advanced to the fourth round after defeating Radek Štěpánek, Dustin Brown and Feliciano López. In the fourth round Kyrgios lost to 2nd seed and eventual champion Andy Murray. Kyrgios then competed at the Rogers Cup as the 11th seed, where he lost in the first round to wildcard and home favourite Denis Shapovalov. Kyrgios then played at Atlanta as the second seed. He advanced to the final after defeating wildcard Jared Donaldson, fifth seed Fernando Verdasco and unseeded Yoshihito Nishioka. In the final Kyrgios faced number 1 seed and three-time defending champion John Isner, and defeated him to win his second ATP title. Kyrgios reached a career-high ranking of number 16 following the tournament. Kyrgios reached the third round of the 2016 US Open against Illya Marchenko, before retiring with a hip injury that had also affected him in previous rounds. He returned with a straight-sets win in his rubber for Australia in the Davis Cup World Group playoff. In October, after a second-round loss against Kevin Anderson at the 2016 Chengdu Open, Kyrgios immediately bounced back by winning his first ATP World Tour 500 series title in Tokyo at the Rakuten Japan Open Tennis Championships, defeating David Goffin in three tight sets. This was the biggest tournament win of his career. Kyrgios started the season at the 2017 Hopman Cup. He defeated Feliciano López and Adam Pavlásek but lost to Jack Sock. At the 2017 Australian Open, Kyrgios was seeded 14th. He defeated Gastão Elias before falling to Andreas Seppi in round two, despite leading 2 sets to 0. At the Mexican Open, Kyrgios defeated Novak Djokovic in straight sets in the quarter-finals. In doing so, he had managed to defeat all of the big three—Roger Federer, Rafael Nadal and Djokovic—in his first attempt. Djokovic had managed to win just 20.5% of return points in the match, his lowest ever in a tour match. Kyrgios eventually fell to Sam Querrey in 3 sets in the semi-finals. Kyrgios yet again defeated Djokovic in straight sets in the fourth round of the Indian Wells Masters tournament. He then withdrew from his quarter-final match with Roger Federer due to illness. He then moved to Miami. He beat David Goffin and Alexander Zverev before losing in the semi-finals in three tie-break sets to Federer in three hours and ten minutes. Kyrgios then participated in Madrid, where he lost in straight sets in the third round to Rafael Nadal. At Roland Garros, Kyrgios lost to Kevin Anderson in the second round after winning the first set. He then withdrew from his first-round matches at Queen's Club, Wimbledon and Washington due to injuries. After his recent slump in form, Kyrgios then reached the third round of the Montreal Masters, where he lost to Alexander Zverev in straight sets. In the Cincinnati Masters, Kyrgios made it to the quarter-finals, where he defeated world no. 2 Rafael Nadal in straight sets. He followed that up with a victory over David Ferrer to make it to his first Masters 1000 final, where he lost to Grigor Dimitrov in straight sets. At the China Open, Kyrgios defeated Nikoloz Basilashvili, Mischa Zverev, Steve Darcis and Alexander Zverev en route to the final against Nadal. Kyrgios's victory over Alexander Zverev was his third out of four meetings between the rivals. However, he was then crushed by Nadal in the final, losing (2–6, 1–6). Kyrgios's record against Nadal fell to 2–3 with this loss. In his first tournament of the season at the 2018 Brisbane International, Kyrgios received a bye into the second round due to being the 3rd seed. In his first competitive match since the 2017 European Open, Kyrgios lost the 1st set against his compatriot, Matthew Ebden in a first-set tie-break but later found his form and won in three sets. His next opponent would be Ukraine's Alexandr Dolgopolov. He once again recovered from a slow start as he lost the first set, 6–1, to the crafty world no. 38. Like in his first match though, he found a way to power past the former world no. 12 and schedule a rematch of the Cincinnati Masters final against now world no. 3 and defending champion, Grigor Dimitrov. For the third match in a row, the Australian found himself a set down against the Bulgarian, who appeared set for a third Brisbane final. Kyrgios, though, had other ideas blasting his way through the second set, 6–1 and forcing the decisive break out of Dimitrov in the third set to seal his 6th win out of 10 against top 3 opponents. In total, he would serve 19 aces in the semi-final encounter. His next and final opponent at Brisbane was Ryan Harrison. Harrison started strongly, conjuring five break points in two of Kyrgios's first three service games. After failing to convert on any of these chances, Kyrgios pounced on his first opportunity to lead 4–3 and eventually see out the first set by 6 games to 4. From then on, Kyrgios stormed through the second set, breaking Harrison twice more to win his first title since Tokyo 2016. Kyrgios' win returned him to the top 20, rising back to no. 17, narrowly missing out on a top 16 seeding at the upcoming Australian Open. At the Australian Open Round of 32 Kyrgios defeated Jo-Wilfried Tsonga in four sets, but was then beaten by Grigor Dimitrov in a tight four sets, with the latter winning three tie-breaks. Kyrgios served 36 aces in that match. After the Australian Open, Kyrgios was defeated in four sets by Alexander Zverev at the Davis Cup. It was soon revealed that he was playing with an elbow injury. In light of this development, he cancelled appearances at the Delray Beach Open and Indian Wells Masters tournament. He resumed his season at the Miami Open, defeating Dusan Lajovic and Fabio Fognini in straight sets before falling to Next Gen paragon Alexander Zverev, Jr. in straight sets. Kyrgios weathered a lackluster clay season, beginning with the U.S. Men's Clay Court Championships in Houston, Texas. He started with a win over Bjorn Frantangelo before Ivo Karlovic halted his progress. His next tournament was in the doubles section of the Lyon Open, where he and Jack Sock claimed the title. This was followed by a last-minute cancellation at the French Open, where he would have also faced fellow provocateur and countryman Bernard Tomic. He cited the elbow injury that spoiled the first quarter of 2018. The transition to grass season was more fruitful. Kyrgios and Jackson Withrow of the U.S.A. were knocked out of the first round doubles match by Sriram Balaji and Vishnu Vardhan. His next tournament, the Stuttgart Open, saw him reach the semifinals, falling (7–6(7–2), 2–6, 6–7(5–7)) to eventual champion Roger Federer. Following Stuttgart, Kyrgios entered the Queen's Club Championships. His first round match was a victory over former World No. 1 Andy Murray with a score of (2–6, 7–6(7–4), 7–5). This was notable as it was Murray's return to the tour since Wimbledon 2017 and it was Kyrgios' first professional win over Murray after five prior attempts. This was followed by a three-set win over Kyle Edmund (7–6(7–3), 6–7(5–7), 6–3) and a straight sets victory over defending champion Feliciano Lopez (7–6(7–5), 7–6(7–3)) in the Quarterfinals. He was defeated in the semifinals by Marin Cilic in two tiebreaks, (6–7(3–7), 6–7(4–7)). Despite his bellicose attitude during his run, he enjoyed the tournament, describing several moments as "untouchable." He racked up 98 aces in four matches and ran his opponent to a tiebreak in each match. At Wimbledon, Kyrgios defeated Denis Istomin and Robin Haase but lost to Kei Nishikori in straight sets in the third round. The American hard court summer season produced lackluster results. In Atlanta, Kyrgios defeated Noah Rubin before retiring to Cameron Norrie in the quarterfinals. His campaign in Toronto at the Canadian Open ended after a three-set encounter with Stan Wawrinka with a score of (6–1, 5–7, 5–7). The Western and Southern Open, where he was finalist last year, saw him beat Denis Kudla and rising star Borna Coric only to be blocked in three sets by Juan Martin del Potro. His campaign in the 2018 U.S. Open generated controversy in his second-round match where he appeared to be given advice from umpire Mohammed Lahyani, which seemed to turn the tide in his match against Pierre-Hughes Herbert, winning (4–6, 7–6(8–6), 6–3, 6–0). Kyrgios' U.S. Open run ended in the next round by Roger Federer, who saw him out in straight sets. At the annual Laver Cup Kyrgios was defeated by former World no. 1 Roger Federer in straight sets. He then proceeded to win the doubles with Jack Sock against Grigor Dimitrov and David Goffin. At the Rakuten Japan Open Kyrgios defeated Yuichi Nishioka (7–5, 7–6(7–3)) before losing to French star Richard Gasquet (6–7(4–7) , 6–7(1–7)). His Shanghai Open resembled those of previous seasons, where he was again accused of tanking by the chair umpire before losing to World No. 104 Bradley Klahn (6–4, 4–6, 3–6). His last event on the ATP tour was a wildcard draw at the Kremlin Cup. He defeated Andrey Rublev in three sets before withdrawing against his next opponent Mirza Basic, citing an elbow injury. He also revealed weeks later that he was seeing psychologists to improve his mental health. Kyrgios began 2019 at the Brisbane International, where, as a rematch of last year's final, he defeated Ryan Harrison in the round of 128. He subsequently lost to Jeremy Chardy. His middling performance in his home country culminated in a straight-sets loss to Milos Raonic at the Australian Open. His next venture was the Dallas Challenger in doubles, where he and Mitchell Krueger were bounced out in their first match against Andre Vasilevaki and Romain Arneodo. Following the loss, he competed at the Delray Beach Open, where he clinched a tiebreaker win against countryman John Millman but lost to Moldovan player Radu Albot. His next campaign was more successful; Kyrgios won the title in Acapulco after beating three top 10 players (Rafael Nadal, John Isner and Alexander Zverev) and three-time Grand Slam champion Stan Wawrinka en route. His performance suffered thereafter in a second-round defeat to Philipp Kohlscreiber at Indian Wells. His Miami Open campaign was full of the usual controversy: a victory over Dusan Lajovic in the third round involved two successful underarm serves and an altercation with a spectator, and the follow-up loss to Borna Coric in the round of 16 involved another argument with a spectator and both players smashing racquets. Following his loss, he acknowledged his opponent's more disciplined nature and questioned his own motivation. Kyrgios made his Davis Cup debut for Australia in September 2013 against Poland at the age of 18. He replaced Marinko Matosevic after defeating him in a playoff during the lead-up to the tie. He was selected to pair with Chris Guccione in the crucial doubles rubber. They lost to Mariusz Fyrstenberg and Marcin Matkowski in five sets. He then went on to win his first singles rubber, after Michał Przysiężny retired five games into the match. After the media attention attracted during Wimbledon 2015 Kyrgios lost the second rubber of the quarter-final tie against Kazakhstan. His most publicised quote during this match was his comment "I don't want to be here". Kyrgios was then replaced by Sam Groth in the reverse singles rubber. He was dumped from the Davis Cup Squad due to play their semi-final tie against Great Britain. He returned to the Davis Cup team in September 2016 for Australia's emphatic World Group playoff victory against Slovakia. Kyrgios qualified for his first Olympics at Rio 2016 but withdrew from the event due to differences with the Australian Olympic Committee. However, Kyrgios later revealed he hoped to compete at Tokyo 2020. Kyrgios claims to not fear any opponent, and says he always plays aggressively. Former British number one John Lloyd described watching Kyrgios as a "pleasure" because of "the mixture and the flair", adding that his character is one which attracts fans. According to three-time Wimbledon champion John Newcombe, Kyrgios is an "exceptional talent" and "a real individual". Nine-time Wimbledon doubles champion Todd Woodbridge stated in 2015 that despite Kyrgios's occasionally regrettable words and actions, he would mature over time. He is constantly described as "box office". Paul Annacone, a former Top 15 tennis player and once coach to Roger Federer, said in 2017, "I think Nick is the most talented player since Roger jumped on the scene." A strength of Kyrgios is his serve; usually reaching higher or equal accuracy percentages of 75%. Nonetheless, he also has a tremendous and blasting forehand as well as a very consistent and dangerous backhand. Adding to his skills are an effective slice and an efficient net game. In spite of the fact that his game suits perfectly grass and hard courts (achieving great results in Wimbledon and the Australian Open), he reached his first ATP Tour final, on clay, in Estoril. The Economist has described Kyrgios as "electric-serving" but a "one-dimensional attacking" player. At the 2015 Wimbledon Championships, after he failed to return numerous serves, Kyrgios was accused of "tanking"—deliberately not playing up to his abilities—during the second set of his fourth-round loss to Richard Gasquet. Kyrgios was booed by the crowd for his perceived lack of effort, but denied the accusations, stating "of course I tried". He admitted in 2017 that he had "probably" tanked at eight tournaments during his professional career, because on certain days he’d "rather be doing something else than play tennis". During a match at the 2015 Rogers Cup, Kyrgios generated considerable controversy for insults he directed at his opponent, Stan Wawrinka. After a point, Kyrgios, speaking aloud but not directly to Wawrinka, said: "Kokkinakis banged your girlfriend. Sorry to tell you that, mate". Microphones also picked up Kyrgios saying under his breath that Wawrinka, 30, is "banging 18-year-olds". After the match, Wawrinka stated he found the comments "unacceptable" and urged action to be taken against Kyrgios. Kyrgios was fined $13,127 and given suspended penalties of $32,818 and a 28-day ban, pending further breaches by the ATP, and claimed he apologised to Wawrinka, though this was later denied by Wawrinka himself. Nick's mother, Nill, shut down her Twitter account several hours after this incident after personal criticisms were levelled at her. Nill Kyrgios indicated that her son's insults had been made in retaliation. Nill claimed that Wawrinka accused her son of "faking an injury" during a previous match between the two players. Following a review, the ATP handed down a 28-day suspended sentence, to expire after six months. Kyrgios would also have received a $25,000 fine had he incurred a further fine for "verbal or physical abuse" during that six-month period. At the same tournament he received a $3,281 fine for unsportsmanlike conduct for a comment he made to a ball person. In October 2016 Kyrgios was fined $32,900 (on top of an earlier fine of $21,659—$13,127 for lack of effort, $6,563 for verbal abuse of a spectator, and $1,969 for unsportsmanlike conduct) and banned for eight weeks for 'lack of best efforts' against unseeded Mischa Zverev in the second round of the Shanghai Rolex Masters. He threw the match 6–3, 6–1, in 48 minutes, at one point asking the umpire, "Can you call time so I can finish this match and go home?" When later asked during a press conference if he thought he owed the fans a better effort, he responded: "What does that even mean? I'm good at hitting a tennis ball at the net. Big deal. I don't owe them anything. If you don't like it, I didn't ask you to come watch. Just leave." The next year, Kyrgios unfolded another drama at the 2017 Shanghai Masters by retiring midway during the first-round match after losing the first-set tie-breaker against Steve Johnson without any apparent health or injury reasons. During the tie-break, he had received a point penalty from umpire, and had responded by saying that he would quit the match if he went on to lose the breaker. He was fined $10,000 for unsportsmanlike conduct and stripped of $21,085 prize money. American former professional tennis player John McEnroe has voiced his harsh opinion of Kyrgios's behaviour several times. Following his defeat at the hands of Andy Murray at the 2016 Wimbledon championships, McEnroe criticised his temperament, saying "Kyrgios has to look in the mirror if he wants to become a top player and win Slams." He questioned his attitude towards the sport as Kyrgios was reportedly seen watching compatriot Lleyton Hewitt in a doubles match shortly before his match with Murray. Two months later and following his exit from the US Open, Kyrgios was subject to further criticism from McEnroe. He called on Kyrgios to retire from the sport, saying: "Nick Kyrgios, if you don't want to be a professional tennis player, do something else." The comments came shortly after his third round defeat by Illya Marchenko, in which he retired due to a hip injury. McEnroe commented: "He's hurt because he's not training enough." At the same time, McEnroe has been openly supportive and hopeful of Kyrgios. In late 2018 on Nine Network’s Sunday Night show in Australia, McEnroe admitted that Kyrgios is “the most talented player [he’s] seen in the last ten years”. McEnroe also stated at the same time that Kyrgios may “run himself out” if he continues to choose not to commit himself to tennis. Kyrgios has openly stated that he "does not love tennis" and has a greater interest in basketball. He openly critiqued his dedication to the sport after his exit at the 2017 US Open to fellow Australian John Millman by stating that he is "not dedicated to the game at all" and "There are players out there that are more dedicated, that want to get better, that strive to get better every day, the one-percenters. I'm not that guy." Kyrgios has also been warned and fined for various other instances of inappropriate behaviour. He was given three code violations for audible obscenities and racket-smashing at the 2014 US Open (one more would have disqualified him), fined $4,926 for audible obscenities and racket-smashing at the 2015 Australian Open, fined $12,470 for unsportsmanlike conduct and $2,625 for swearing at 2015 Wimbledon, fined $4,370 for swearing at the 2016 Australian Open (he also took a phone call while on court during a mixed doubles match), fined $6,200 for swearing at the 2016 French Open, and fined $8,690 for swearing at the 2016 Wimbledon. At the 2018 Queen's Club Championships, Kyrgios was issued a $17,500 fine for making an obscene gesture during a changeover in his semifinal match against Marin Čilić. 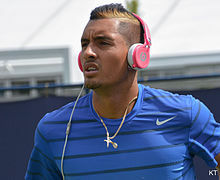 Kyrgios has endorsement deals with several companies, including Yonex, Nike and Beats. Bonds distanced itself from Kyrgios during his controversies of 2015. Malaysia Airlines ended their partnership after Kyrgios was suspended and fined for tanking in 2016 Shanghai Rolex Masters. Kyrgios is the founding contributor of the athlete direct publishing website, PlayersVoice, and has also invested financially in the digital platform. ^ "Nick Kyrgios knocks out Rafael Nadal". BBC. 2014-07-02. Retrieved 2018-01-05. ^ "Rankings | Singles | ATP World Tour | Tennis". ATP World Tour. Retrieved 18 March 2019. ^ a b "Tennis Abstract: Dominik Hrbaty ATP Match Results, Splits, and Analysis". www.tennisabstract.com. Retrieved 19 September 2018. ^ a b "Wimbledon 2016: John McEnroe criticises Nick Kyrgios after Andy Murray loss". 4 July 2016. Retrieved 18 December 2016. ^ "Wimbledon 2015: Nick Kyrgios beats Milos Raonic in round three". BBC Sport. 2015-07-03. Retrieved 2018-01-21. ^ Pearce, Linda (2018-01-19). "The changing public perception of Nick Kyrgios: still no angel but nor a lost cause | Linda Pearce". the Guardian. Retrieved 2018-01-21. ^ a b Michelle Tam (6 July 2014). "Tennis pro very close to relatives in Shah Alam, says mum". The Star. ^ Leo Schlink (1 July 2014). "Rod Laver says Nick Kyrgios can put pressure on Rafael Nadal at Wimbledon tonight". NEWS CORP AUSTRALIA. Retrieved 2 July 2014. Kyrgios' manager John Morris: "Then you've got the mass audience he can potentially reach in Malaysia with his Mum (Norlaila) being half Malaysian and the entire Asian community." ^ Adam Harvey (2 July 2014). "Australian tennis hopeful Nick Kyrgios might be 'the one' but first he needs to play Rafael Nadal". ABC. Retrieved 2 July 2014. ^ Jacquelin Magnay (27 June 2014). "Nick Kyrgios now feels the Grand Slam pressure". The Australian. Retrieved 2 July 2014. ^ Chris Dutton (19 September 2014). "Nick Kyrgios and royal mum, Nill, can claim tennis crown at Malaysian Open". Sydney Morning Herald. Retrieved 20 September 2014. ^ a b "ATP Player Profile – Nick Kyrgios". www.atpworldtour.com. Association of Tennis Professionals (ATP). ^ "NICK KYRGIOS, DARAMALAN STUDENT". Missionaries of the Sacred Heart Australia. 11 February 2014. Retrieved 27 September 2018. ^ Perrotta, Tom (17 January 2014). "For Kyrgios, a Website-Busting Australian Open Run". WSJ. Retrieved 25 November 2014. ^ Matthew Biddle. "DARAMALAN CHEERS ON NEW TENNIS STAR". MSC Australia. Retrieved 25 November 2014. ^ Michael Chammas (19 January 2014). "Nick Kyrgios is winning over fans with his fighting spirit". Sydney Morning Herald. Retrieved 9 March 2015. ^ Pearce, Linda (25 January 2013). "Newly crowned No.1 reaps reward of choosing right court". Sydney Morning Herald. Retrieved 25 January 2013. ^ Dutton, Lee Gaskin and Chris (3 July 2014). "New $27 million ACT sports centre to provide perfect home for Nick Kyrgios". ^ Dutton, Chris (19 December 2014). "Nick Kyrgios ready to take next step in career and prove beating Rafael Nadal wasn't a one-hit wonder". ^ Dutton, Chris (24 January 2015). "Nick Kyrgios to honour his Nanna's memory in Canberra" – via The Sydney Morning Herald. ^ "Nick Kyrgios Shares Kiss with New Love Interest Ajla Tomljanovic in front of Australian Open Cameras". Herald Sun. 26 January 2016. Retrieved 8 March 2016. ^ "Loving The Clay – Nick Kyrgios – Official website". nickkyrgios.org. ^ "Tennis star Nick visits Hotspur Way 14 November 2014 - News - tottenhamhotspur.com". www.tottenhamhotspur.com. ^ Kyrgios, Nicholas (5 February 2014). "Even though Kevin Garnett is no longer a member of the celts, he still is my favourite player. He is my idol. #passion #pride". ^ "Mav catches up with Hewitt & Kyrgios – saints.com.au". ^ "Nick Kyrgios Promotes AUSCOIN ICO". Tennis World USA. Retrieved 2018-01-19. ^ Zara McDonald (2018-01-17). "Who is Nick Kyrgios' girlfriend? Meet Ajla Tomljanović". MamaMia. Retrieved 2018-01-17. ^ "Fanning, Kyrgios win". Fiji Sun. Retrieved 11 March 2013. ^ "Kyrgios has sights on Open season". The Canberra Times. Retrieved 11 March 2013. ^ "Nick Kyrgios is the favourite for the boys' championship". The Australian. 21 January 2013. Retrieved 21 January 2013. ^ "Nick Kyrgios wins Australian Open boys' singles title". Herald Sun. 26 January 2013. Retrieved 26 January 2013. ^ "Nick Kyrgios ready to jump into big time". The Australian. 28 January 2013. Retrieved 21 January 2014. ^ "Kyrgios proves he's up to the Challenger". The Canberra Times. Retrieved 24 January 2014. ^ "Injury cruels Millman's French bid". Tennis Australia. Retrieved 24 January 2014. ^ "Australian Nick Kyrgios upsets Radek Stepanek in opening round". ABC Grandstand Sport – ABC News (Australian Broadcasting Corporation). Retrieved 24 January 2014. ^ "Kyrgios puts up brave fight against fourth seed". The Canberra Times. Retrieved 24 January 2014. ^ "Kyrgios and Nishikori to start 2014 in Brisbane". Brisbane International. Retrieved 19 January 2014. ^ "Nick Kyrgios shouldered aside from Brisbane International debut in setback for young gun". News.com.au. 30 December 2013. Retrieved 19 January 2014. ^ "Eight Australians handed final wildcard entries into Australian Open main draw". ABC News. Retrieved 19 January 2014. ^ "Nick Kyrgios bucks trend as Matosevic, Duckworth bow out". The Australian. 14 January 2014. Retrieved 19 January 2014. ^ Gleeson, Michael (17 January 2014). "Rising star Nick Kyrgios falls short in epic five-set battle". The Sydney Morning Herald. Retrieved 17 January 2014. ^ "Marinko Matosevic and Nick Kyrgios lose first round at the US National Indoor Championships in Memphis". ABC News. Retrieved 20 April 2014. ^ "Kyrgios withdraws from Delray Beach and Acapulco". ACELAND Tennis. Retrieved 20 April 2014. ^ "Canberra tennis ace Nick Kyrgios wins Sarasota Open in injury comeback". Port Stephens Examiner. Retrieved 21 April 2014. ^ "Nick Kyrgios hits 'shot of the year' v Nadal – Wimbledon 2014". The All England Lawn Tennis Club. Retrieved 2 July 2014. ^ Polkinghorne, David (2 July 2014). "Kyrgios' family celebrates win as cheeky shot goes viral". The Canberra Times. Retrieved 4 July 2014. ^ "Nick Kyrgios beats Rafa Nadal and says 'It still hasn't hit me what I've done'". Guardian. 1 July 2014. Retrieved 2 July 2014. ^ "ATP Rankings". ATP World Tour. 7 July 2014. Retrieved 8 July 2014. ^ "Andy Murray to face Nick Kyrgios in Rogers Cup in Toronto". 5 August 2014. Retrieved 7 August 2014. ^ "Andy Murray enjoys straight-sets win over Nick Kyrgios in the Rogers Cup". The Guardian. 6 August 2014. Retrieved 7 August 2014. ^ Marc McGowan (25 January 2015). "Kyrgios: Australian Open last-eight run tops Wimbledon". acelandtennis.com.au. Retrieved 26 January 2015. ^ "Djokovic joins Kyrgios fan club ahead of Murray clash". Special Broadcasting Service. 27 January 2015. Retrieved 27 January 2015. ^ Dutton, Chris (30 January 2015). "Sponsors line up to get a slice of Nick Kyrgios". Sydney Morning Herald. Retrieved 2 February 2015. ^ Polkinghorne, David (1 February 2015). "Nick Kyrgios desperate to play Davis Cup after back injury rules him out of Marseille and Dubai". Sydney Morning Herald. Retrieved 2 February 2015. ^ "Nick Kyrgios stuns top seed Roger Federer at Madrid Masters to move to third round". ABC Grandstand Sport (Australian Broadcasting Corporation). 7 May 2015. Retrieved 7 May 2015. ^ "Nick Kyrgios's Madrid Masters run ends as John Isner claims three-set win". ABC News. 7 May 2015. Retrieved 11 May 2015. ^ Walton, Darren (26 May 2015). "French Open: Six Australians into second round". Sydney Morning Herald. Retrieved 26 May 2015. ^ "French Open: Samantha Stosur last remaining Australian woman, Nick Kyrgios gets walkover into third round". ABC Grandstand Sport (Australian Broadcasting Corporation). 28 May 2015. Retrieved 28 May 2015. ^ Newbury, Piers (30 May 2015). "Andy Murray beats Nick Kyrgios at French Open to progress". BBC Sport. Retrieved 30 May 2015. ^ "Bhupathi-Kyrgios crash out of French Open". First Post. 27 May 2015. Retrieved 1 June 2015. ^ "Nick Kyrgios shines on Wimbledon return to blast past Diego Schwartzman". The Guardian. 29 June 2015. Retrieved 3 July 2015. ^ Bull, Andy (1 July 2015). "Nick Kyrgios shows his good, bad and ugly side in win over Juan Mónaco". The Guardian. Retrieved 3 July 2015. ^ The Guardian (3 July 2015). "Nick Kyrgios bounces racket into crowd during tantrum at Wimbledon". ^ a b c d e Newbury, Piers (3 July 2015). "Wimbledon 2015: Nick Kyrgios beats Milos Raonic in round three". BBC Sport. Retrieved 3 July 2015. ^ "Dimitrov Halts Kyrgios Comeback To Reach Quarter-Finals". www.atpworldtour.com. Retrieved 21 January 2018. ^ "Dimitrov withstands Kyrgios barrage". 21 January 2018. Retrieved 21 January 2018. ^ "Alexander Zverev battles past Nick Kyrgios in Miami". The Independent. Retrieved 2018-06-23. ^ "Kyrgios' sacrifice set to pay off". NewsComAu. Retrieved 2018-06-23. ^ "Roger Federer back at number one after edging out Nick Kyrgios in thriller". Sporting News. 2018-06-16. Retrieved 2018-06-23. ^ "'That's insane': Kyrgios blows minds". NewsComAu. Retrieved 2018-06-23. ^ "Relentless Cilic edges Kyrgios to set up Djokovic final". Retrieved 2018-06-23. ^ Park, Simon Cambers at Melbourne (2019-01-15). "Nick Kyrgios outplayed by Milos Raonic in straight-sets defeat". The Guardian. ISSN 0261-3077. Retrieved 2019-04-04. ^ "Nick Kyrgios tops stellar week with Zverev win". Retrieved 2019-03-03. ^ "Nick Kyrgios praises Philipp Kohlschreiber after early Indian Wells exit". Tennis World USA. Retrieved 2019-04-04. ^ "Smashed rackets and obscenities: The full Nick Kyrgios experience". ESPN.com. 2019-03-27. Retrieved 2019-04-04. ^ "Nick Kyrgios drafted into Australia's Davis Cup squad as Jerzy Janowicz ruled out for Poland". ABC Australia. 12 September 2013. Retrieved 15 September 2013. ^ a b "Kazakhstan leads Australia 2–0 in Davis Cup tie". ABC News. Retrieved 2015-08-17. ^ "Nick Kyrgios dropped from Davis Cup squad". ABC News. Retrieved 2015-09-13. ^ "Nick Kyrgios pulls out of Olympic team, slams 'unjust treatment'". 3 June 2016. ^ "Nick Kyrgios, the Reluctant Rising Star of Tennis". The New Yorker. Retrieved October 7, 2017. ^ J.S. (4 September 2017). "Alexander Zverev could be tennis's next star, despite his height". The Economist. ^ "Roger Federer weighs in on underarm serve, Nick Kyrgios vs Rafael Nadal". www.news.com.au. Retrieved 2019-04-04. ^ Michael Chammas (7 July 2015). "Wimbledon 2015: Nick Kyrgios booed by crowd amid tanking accusations". www.smh.com.au. Sydney Morning Herald. Retrieved 21 February 2016. ^ "Nick Kyrgios sparks fury by sledging Stan Wawrinka over his girlfriend", telegraph.co.uk, 13 August 2015. ^ "Stan Wawrinka unhappy at 'unacceptable' Nick Kyrgios", bbc.com, 13 August 2015. ^ Patterson, Kelsey, "Nick Kyrgios fined, apologizes for insulting Stan Wawrinka at Rogers Cup", cbc.ca, 13 August 2015. ^ a b c Randall, Michael (October 17, 2016). "Nick Kyrgios career rap sheet: Tennis star's misdemeanors, fines and fights through the years". Herald Sun. Retrieved 2018-01-25. ^ "Nick Kyrgios has not apologised to Stan Wawrinka over girlfriend sledge, claims French Open champion", independent.com.uk, 20 August 2015. ^ Polkinghorne, David, "Nick Kyrgios sledge of Stan Wawrinka due to previous bad blood, says Nill Kyrgios", theage.com.au, 14 August 2015. ^ "ATP Completes Review Into Kyrgios Incident | ATP World Tour | Tennis". Retrieved 2015-08-31. ^ Danielle Rossingh (17 October 2016). "Nick Kyrgios banned for not trying in tennis match, urged to see psychologist". CNN. ^ "Kyrgios booted off ATP Tour due to Shanghai Masters capitulation". 17 October 2016. Retrieved 19 September 2018. ^ Hogan, Lauren, "Nick Kyrgios Acts Like Total Baby at Shanghai Masters, Fined $17,000", thatsmags.com, 14 October 2016. ^ "John McEnroe calls on Nick Kyrgios to make decision about career after US Open defeat". 4 September 2016. Retrieved 18 December 2016. ^ "John McEnroe fearful Nick Kyrgios will 'run himself out' of tennis". The Guardian. 25 Nov 2018. ^ "Tennis news: John McEnroe: 'Nick Kyrgios is the most talented guy I've seen in a decade'". Eurosport. 9 Jan 2019. ^ "Kyrgios prefers basketball to tennis: "I don't love the sport"". Retrieved 19 September 2018. ^ "Enigmatic as ever, Nick Kyrgios makes early exit". Retrieved 19 September 2018. ^ "Kyrgios fined over obscene gesture at Queen's". www.msn.com. Retrieved 19 September 2018. ^ Leo Schlink (1 July 2014). "Nick Kyrgios set to benefit from upgraded deals with sponsor Yonex and clothing giant Nike". The Courier Mail. Retrieved 21 February 2016. ^ Kimmorley, Sarah. "Nick Kyrgios is no longer a brand ambassador for Bonds". Retrieved 2015-09-06. ^ Robyn Ironside (18 October 2016). "Nick Kyrgios splits with Malaysia Airlines as their partnership ends, and Guy Sebastian joins AirAsia X". Herald Sun. Retrieved 31 October 2016. ^ "Nick Krygios and Matt Berriman tip in as PlayersVoice raises $4 million, strikes Fox Sports content deal". Australian Financial Review. March 18, 2018. ^ "Australian Open 2015: 10 fascinating facts about Nick Kyrgios' win over Andreas Seppi". The Daily Telegraph (Australia). 26 January 2015. Retrieved 26 January 2015. 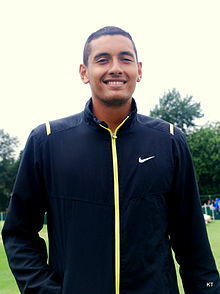 Wikimedia Commons has media related to Nick Kyrgios. This page was last edited on 14 April 2019, at 00:23 (UTC).